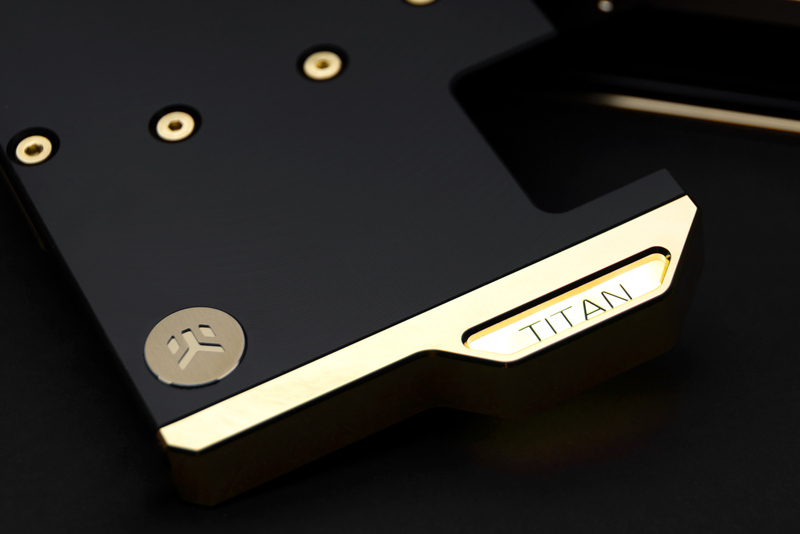 EK® Water Blocks, the Slovenia-based premium computer liquid cooling gear manufacturer, is releasing a gold-plated water block for the most powerful PC GPU on the market today, the NVIDIA® Titan RTX. 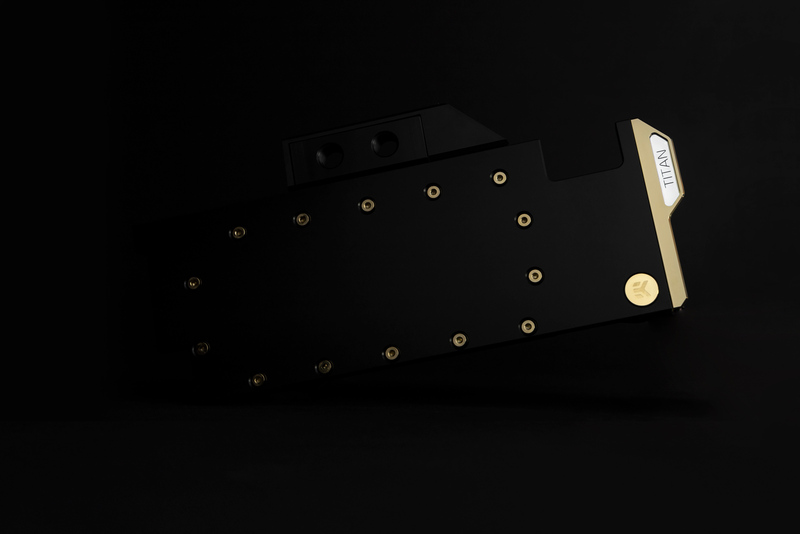 EK Vector Titan RTX full cover GPU water block will help you unlock the full potential of the Turing architecture based NVIDIA® Titan RTX while keeping the card ice-cold! The water block directly cools the GPU, VRAM and the VRM (voltage regulation module) as cooling liquid is channeled directly over these critical areas. 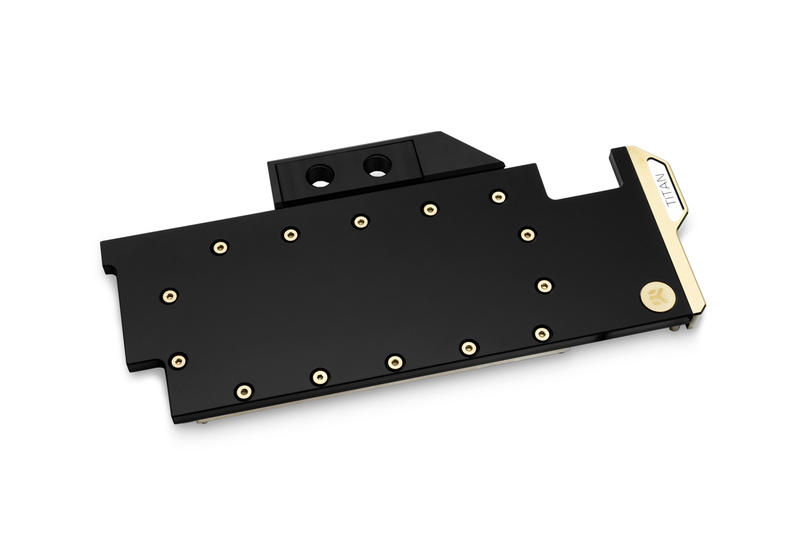 This special edition water block features a redesigned cooling engine that has a larger footprint compared to the previous generation of EK Full Cover water blocks. This results in a larger surface area for heat transfer which increases the thermal performance of these water blocks. The EK-Vector Series water blocks use an Open Split-Flow cooling engine design which proved to be a superior solution for GPU water blocks. It is characterized by low hydraulic flow restriction, which means that it can be used with weaker water pumps, or pumps running on low-speed settings and still achieve top performance. The jet plate and fin structure geometry have been optimized to provide even flow distribution with minimal losses and optimal performances even when used in reversed water flow scenarios. The base of the block is CNC machined out of gold plated electrolytic copper while the top is CNC machined out of black POM acetal material. Sealing is ensured by high-quality EPDM O-Rings. The brass standoffs are already pre-installed and allow for a safe and easy installation procedure. The front aesthetic corner piece is lit up with a special LED light diffuser. This product is compatible with popular RGB sync technologies from all major motherboard manufacturers. The arrow marking on the 4-pin LED connector is to be aligned with the +12V marking on the RGB header. EK also provides a single-slot I/O bracket which replaces the original two-slot in order to make installation of multiple graphics cards easier and also transforms the GPU into a gorgeous single slot solution! This product is compatible with popular RGB sync technologies from all major motherboard manufacturers. The arrow marking on the 4-pin LED connector is to be aligned with the +12V marking on the RGB header. 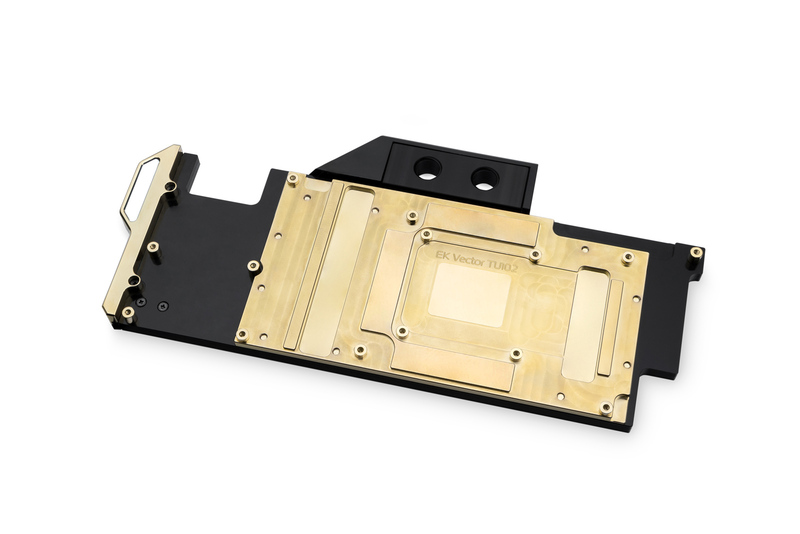 EK-Vector RTX Titan water blocks are made in Slovenia, Europe and are available for purchase through the EK Webshop and Partner Reseller Network. It is available for pre-order and will start shipping on Friday, 5th of April 2019. In the table below you can see manufacturer suggested retail price (MSRP) with VAT included. EK-Velocity RTX Titan 249.95€ Order now!